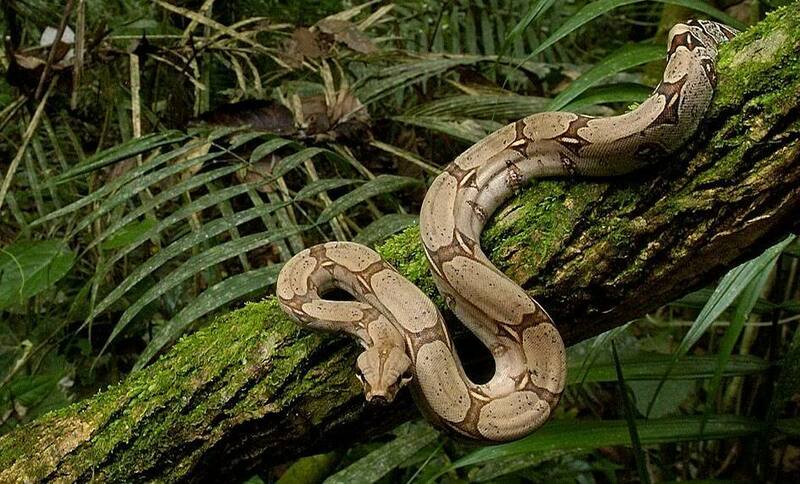 Today I want to write about one of the most beautiful snakes in the world, the boa constrictor. These beautiful looking snakes grow almost 4 metres long, with females much longer than males. Boa constrictors hunt at night, using special heat-seeking pits to find their prey which includes rodents, birds, bats, lizards, monkeys, pigs and even ocelots. Young boa constrictors hunt in trees, but move to the ground to hunt more when they get bigger. Some people in South America like to have boa constrictors near their houses as they keep the numbers of rats down. They don’t have fangs, but their mouths have rows of small, sharp teeth that hold their prey until they wrap their muscular bodies around them to constrict their breathing before swallowing their meal in one piece. They usually live by themselves, so at breeding time the females emit a smell to attract males. Like other boas, they give birth to live young with an average of 25 babies born each time. They are about 50 cm long at birth. Boa constrictors are found in a very wide range of habitats, from deserts to tropical rainforests and vary in colour depending on where they live. They can be found from northern Mexico down throughout Central and South America and on a few Caribbean islands. Are there any other interesting facts that you would like to share about boa constrictors? I realy like your post and i want you to write more about mammals in the sea.